Sometimes I feel like every single one of my Dance Legend reviews goes something along the lines of "WOWYOUNEEDTHISGOBUYITNOW!!" Well...aside from Termo 170, but I think my bottle is damaged. Today's look at NY NY, from their new Las Vegas collection, is gonna be another one of those gushy posts. Can't help it. I love this brand! If they were available at a brick-and-mortar store near me, they'd probably surpass OPI as my favorite brand. As heretical as that statement feels to an OPI fangirl like me, I love them that much. 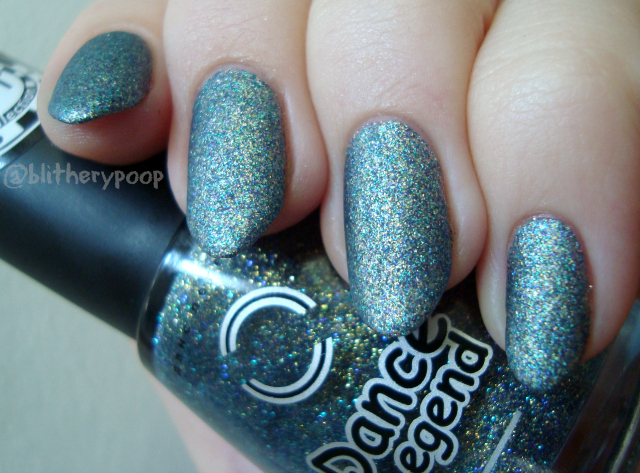 NY NY has dense blue, teal, and gold ultra-fine glitter in a clear base. All of the shades in this collection are named for Las Vegas casinos. I've never been there (just to Atlantic City, NJ [and I didn't like it]), so my only experience of NY NY is Anthony Bourdain's shock, disgust, and dismay when he visited it on one of his older shows. I won't hold that against this polish for a single second. Look at it! Sparkles! Depth! Blueness! Glow! 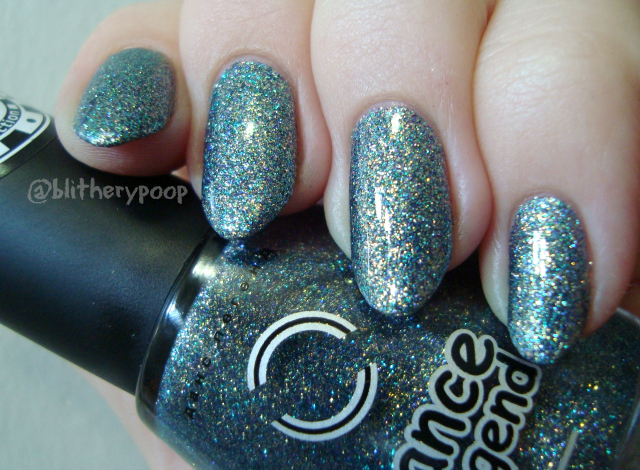 The cap lights up, which is a little weird, but...this polish is stunning. The formula's thick, but easy to work with. This is three coats, for maximum depth. It is on the thirsty side, but it's completely worth the extra topcoat. I feel like I need to gush a little more. You know how China Glaze microglitters twinkle? Make the glitter much smaller and you'd have what's going on in NY NY. It's beyond microglitter. It's nanoglitter. That just increases its sparkle and impact. Dance Legend clobbered China Glaze at what I used to consider "their game". There's something almost static-y about this finish. As nuts as it goes in my usual CFL/sunlight combo, it has a whole other feel to it in softer light. Just when I thought I couldn't possibly love it more than I did.... I don't think you can blame me at all for being totally nuts over this polish! Bottom line: WOWYOUNEEDTHISGOBUYITNOW!! Kidding. Sorta. This is a gorgeous, stand-out shade with a good formula and possible layering potential. You kinda need it. Also...WOW! Did you get anything from this collection? NY NY was the only shade that really grabbed me when I saw Anna Gorelova's swatches (notice it's the one that got the big photo? ), but I always have that lingering feeling that I missed out on something amazing. 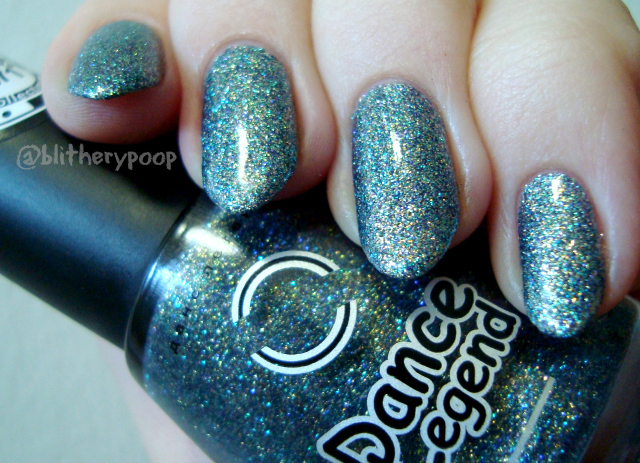 I have been so impressed with Dance Legend too! You're swatches of Different View are what sold me on it and now I believe you've sold me on this too! Going on my wish list immediately!!! Oooooooo, that's really pretty !! Thanks! They're such a tempting brand, aren't they?